Well, another New Year crept up on us once again and once again I will commit to listing on the website! This all started way back in 2012 and several of us continued on in 2013, 2014 , 2015 , 2016. and 2017. Just looking at everyone’s lists over the years you can see how varied our birding lives can be. On Christmas Day we did a bird list around Broome and although we also found over one hundred species on both that day and on New Year’s Day the lists were quite different. Tropical Cyclone Hilda came to Broome in between those dates and the wind and the rain made a huge difference to the bird species that we could observe by January 1st. Once the land flooded the birds dispersed and we could no longer find species that had been relatively easy the week before. The Wood Sandpipers, Sharp-tailed Sandpipers, Little Curlew and Australian Pratincoles had moved away from the ephemeral lakes where there were no longer muddy edges. 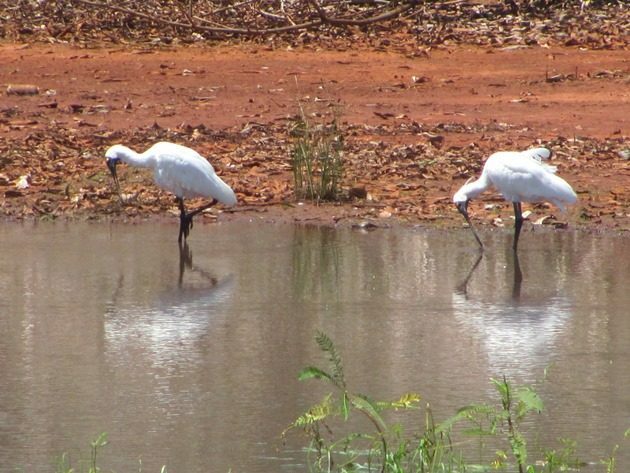 Muddy puddles near the supermarket offered birds such as the Royal Spoonbills in the above header photo and other birds had completely deserted town. In fact you could do a new list every day of the year in the same location and the birding would be different, but isn’t that the attraction of birding?! There is no doubt that over the coming year we will be away camping and birding and we have plans to explore on foot anywhere we can’t get to by vehicle whilst the land is flooded, so you can watch the list below get longer as the year progresses. As usual it is all about having fun and seeing what crosses our path and making some nice memories and possibly some good photos along the way! Thankfully I can write these posts in advance and then disappear into the “bush” and enjoy all that is out there! You won’t find me on social media! This list was last updated December 9th 2018. Clare, you and your Australian birds are a phenomenon! So far on the Olympic Peninsula in the USA I’ve seen about 1/4 the species you’ve seen. And most are shades of gray. We have had a good start to 2018 and will soon have to wander beyond Broome to find new species! WOW!! and I thought I was off to a good start. What a great first week list, all of which is making just that more excited about getting down there and adding some of those to my list! Thanks for all the help you have given me already!